You'll be £19.99 closer to your next £10.00 credit when you purchase Guthrie's War. What's this? George James Guthrie is one of the unsung heroes of the Peninsular War and Waterloo, and of British military medicine. He was a guiding light in surgery. He was not only a soldier's surgeon and a hands-on doctor, he also set a precedent by keeping records and statistics of cases. While the innovations in the medical services of the French Republic and Empire have been publicized, a military surgeon of the calibre of Guthrie has been largely ignored by students of the period – until now. 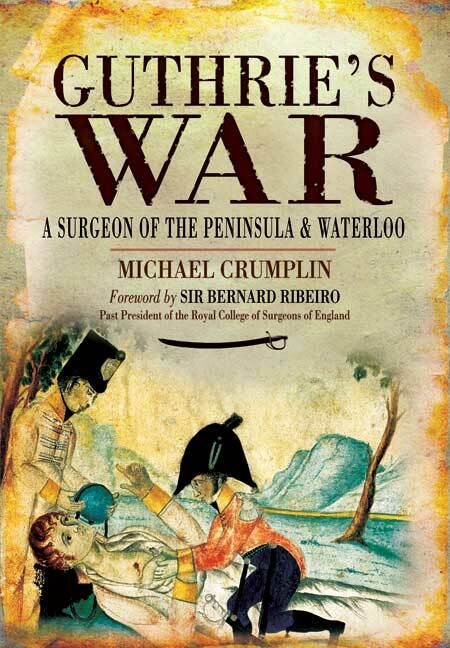 Michael Crumplin, in this comprehensive and graphic study of this remarkable doctor, follows him through his career in the field and recognizes his exceptional contribution to British military medicine and to Wellington's army. Michael Cumplin is a retired surgeon who has made a special study of medicine in the Republican and Napoleonic Wars for over 30 years. His historical research has resulted in two books: A Surgical Artist at War (co-written with Peter Starling), a study of Sir Charles Bell's illustrations of battle injuries from Corunna and Waterloo, and Men of Steel, a comprehensive account of military surgery in the Republican and Imperial French wars. He has lectured internationally, acted as an advisor for media programmes and films, including Master and Commander, and he is curator and archivist at the Royal College of Surgeons. An inspiring read for any surgeon. [The author] is clearly an expert on the period. Guthrie's contributions to the understanding of military surgery are very well summarised at the end of the text. The accounts of surgery are numerous and brilliantly written. Highly recommended. The author has established himself as an expert on early military medicine and this volume continues his work with a study of pioneering military surgeon George James Guthrie, who served the Duke of Wellington during the Peninsular War. Largely overshadowed by the achievements of the French medical services, Guthrie was notable for keeping a set of records on all his operations on soldiers, which provided a highly useful body of data on battlefield trauma. Crumplin has mined this body of work to produce graphic descriptions of operations carried out on soldiers, some of them of very high rank. It is a vivid reminder of the reality of war an the price our soldiers pay to serve their country. All in all, an outstanding account of one of the unsung heroes of the Napoleonic wars. George James Guthrie is one of those unsung heroes of the Peninsular War and Waterloo campaign, and of British military surgery and medicine. Mick has produced a comprehensive and graphic study of this remarkable doctor and relates his contribution to the success of Wellington's Army. While the likes of Larrey and the Grench medical services have been studied in great detail, military surgeons of the calibre of Guthrie have tended to be ignored by students of the period. The author tells Guthrie's story from his appointment as surgeon of the 29th foot and the inclusion of this regiment in the army sent to Portugal in 1808. Guthrie followed the army through the Peninsula campaign and the story is told against the backdrop of the many actions fought during that campaign. However, the most fascinating aspect of this book is the description of the medical arrangements made for the army, and the treatment of various medical conditions. Guthrie was very much a soldier's surgeon and a hands-on doctor, and kept records and statistics of cases that the author has drawn on to give us this detailed account. Guthrie as a surgeon was required to witness regimental punishments and his accounts included descriptions of the floggings he witnessed and the character of the men being punished. All battles generate casualties, and Guthrie describes the type of wounds received by the soldiers and how they were treated. Any study of the Peninsular War will include general accounts of how and when the casualties were treated. In this book we get the details of such treatments and the lessons that men such as Guthrie learnt whilst on campaign. The problems in treating haemorrage, shattered limbs, skull wounds, musket balls passing through sensitive areas of the body (! ), post operative treatment and the ever-present danger of infection. It is interesting to learn of the surgical procedures practiced at the time, various incisions made in the skin, ligation of the blood vessels, and exposure and amputation of the limb, then post-operative treatment to encourage healing, including the administration of cordials, lemonade, opiates and a simple diet. Casualties arose from battles, sieges and day-to-day life on campaign, and Guthrie had to deal with them all, so he had a large pool of subjects to learn from, and from this account it is evident that he was learning his profession all the time. He also had to work with Wellington, other senior officers, and Dr James McGrigro, plus perform his medical duties with the often limited resources available to him. This is where the author has provided us with a unique and original contribution to the vast array of books on this campaign, in that we are given details of military medicine of the time, plus Guthrie's views on surgery. Being a retired surgeon, Mick is able to apply a modern medical analysis of the procedures in use two hundred years ago. Guthrie's War contains a selection of original drawings, battle maps and narrative. This book provides a detailed account of a subkect not usually dealt with in such detail in most histories of Wellington's campaigns. If you have an interest in the subject, or want to learn about the medicine of the period in all its gory detail, then this book is a recommended read. To anyone who has an interest in military surgery, Guthrie's War is a fascinating read. Michael Crumpil, surgeon, archivist at the Royal College of Surgeons of England and well-known military historian has traced Guthrie's career from being the youngest to pass the examination for Membership of the College at 16 years through his career to a short appreciation of his three terms as President of what was then the Royal College of Surgeons of London. Those already are students of the Peninsular War and Wellington's campaign will acknowledge the detail of the various units which Guthrie supported as the reader is taken very rapidly from campaign to campaign, but throughout there are well described clinical vignettes which bring out the care which Guthrie had from individual casualties and how he developed his principles of managing the horrific injuries faced with huge numbers of casualities, understaffed, lacking in resources and often without senior support. It is the number and detail within these case recordings, which illustrate the problems, which Guthrie faced and make this book so relevant. Guthrie was one of the first to appreciate the essential need to collect data, subject it to audit and alter his approach. His contributions in trauma management will strike a cord with those who currently deal with such injuries. He recognised the need for early amputation of limbs when the limb was clearly unsalvageable, yet conservative management where feasible; in vascular surgery where compression was preferable to the immediate application of tourniquet, isolation of bleeding vessels was preferable to merely litigating the feeding artery proximal to a wound and decompression of swollen limbs; the need to remove debris and clothing taken into wound by bullets, or later drain the inevitable abscesses. If only he and colleagues had audited the results of the widespread habit of 'bleeding the patient', maybe many more lives would have been saved. Crumplin seeks to elevate Guthrie to the status of Baron Larrey, Napoleon's surgeon, the 'father' of military surgery whom Guthrie never met. There may well be justification in this but we are two centuries further on. What an exchange of vies there could have been had there been an international military surgical conference in the early 1980s! With such a background, it is not surprising that Guthrie found it difficult to settle in peacetime to the more gentile surgical practice in London, but publications and teaching followed and he was elected onto the Council of the RCS of London at 39 years, overcoming prejudice and driving through reforms as its President. This book can unequivocally be recommended for anyone interested in the history of surgery. George James Guthrie is one of those unsung heroes of the Peninsular War and Waterloo campaign, and of British military surgery and medicine. Mick Crumplin has produced a comprehensive and graphic study of this remarkable doctor and relates his contribution to the success of Wellington's Army. This book provides a detailed account of a subject not usually dealt with in such detail in most histories of Wellington's campaigns. If you have an interest in the subject, or want to learn about the medicine of the period in all its gory detail, then this book is a recommended read. An author is casting fresh light on an "unsung hero" pf the 19th century in his latest work. Wrexam-based Michael Crumplin has published Guthrie's War: A Surgeon of the Peninsula and Waterloo, a comprehensive study of George James Guthrie. One of the pioneers of military surgery, Guthrie's achievements have been largely forgotten today. Mr Crumplin is himself a retired surgeon as well as being the current curator and archivist at the Royal College of Surgeons of England. Guthrie's War looks at the surgeon's life and work during the Napoloenic Wars. Guthrie was, as Mr Crumplin puts it, "a soldier's surgeon" and as well as looking at the historic context of his work the book also documents action seen by Guthrie. It recounts one such occasion: "I accompanied the light troops to the front, and had a little skirmish with the French runaways, who were making their escape from the end of every street. "Some of them brought up a gun, but on seeing us, and also that the road was occupied, as it turned in front of us, dismounted and left the gun with the four mules that drew it. These I seized..."
What is evident from the book is that Guthrie was a robust and determined military man. On one occasion he set up his own field hospital so as not to have to take patients to the existing facility where disease was rife. Guthrie ensured the survival of a remarkable number of the patients he treated, given that this was before the age of antiseptics. Painstakingly researched and at times very graphic, Guthrie's War gives a real insight into the work of a military surgeon at this time, as well as into a conflict from the perspective of someone who was centrally involved. I'm not the greatest of people with squeamish stuff - graphic descriptions of nasty wounds make me toes curl. I studied 'medicine through time' for GCSE History, and eve then medical history, although interesting, would make my stomach churn. Yet despite that, I could never deny that Medical History is interesting. Its at an intersection between history and science. And more often than not, most medical advances are inspired by war. And this book is a prime example of a skilled medic who honed his skills during war time. George Guthrie is one of the unsung heroes of the Napoleonic Wars. Not only was he one of the most forward thinking surgeons of his time, he also kept detailed case records and statistics, which here are edited by Michael Crumplin, himself a retired surgeon. There are some pretty gruesome cases described here. Its not surprising that terrible wounds shock us, as most Hollywood films show the hero being shot cleanly through the heart, saying "tell Jane that I love her' and the lolloping his head to one side. As Guthrie shows, bullets do not make nice neat holes, neither do swords. As a Historian I would be pretty much lost trying to make sense of some of the more scientific details, so its a smart move for Guthrie's account to be edited by a doctor. War gives the surgeon many more opportunities to examine the human anatomy, that in peacetime would only come from dissecting dead bodies. And the opportunity to get to grips with complex trauma wounds led to discoveries and innovations - Guthrie found that when amputating limbs a tourniquet was not always necessary, and that all an assistant needed to do was apply firm pressure on the right arteries. Guthrie also developed an understanding of how to run hospitals with minimising the risk of infection and disease in mind. We often find that the treatment and suffering of wounded during wars brings about a national outcry - particularly the Crimean War, the First World War and to a lesser extent the current Afghan War and Help for Heroes. The Napoleonic Wars might not have caused a revolution in nursing like the Crimea, nor the forming of charities such as after 1918. But its effects were more subtle - slowly, the authorities began to see the importance of good medical services to warfighting. Much as Wellington won his battles partly through solid logistical organisation, he also made medical servces an inherent part of planning and not just a bolt-on. Interestingly, it seems that Guthrie came up opposition from his contemporaries, particularly on his policy of only amputating when absolutely necessary. If we believe other contemporary accounts - such as Bernard Cornwell's Sharpe series, and also accounts of Naval surgery, it would seem that Napoleonic military surgeon's were knife-happy butchers. Maybe the historical convention that all Napoleonic-era military surgeons were butchers needs to be re-thought? There also seems to be a convention that only Napoleonic doctor with any kind of forward-thinking was the Empereur's personal surgeon, Dr Larrey. Yet this account of Guthrie's war service suggest that medical science in the British Army was not as barbaric as we might immediately think. This is a good book for those who have a particular interest in the Peninsular War of 1808-1814, in that considerable detail is given regarding the actions and composition of the British and Allied armies of that period. An accurate account is also given of the conditions under which those armies fought, to the extent that one wonders at the stamina and determination of the private soldier in circumstances which many of us to-day would find intolerable. Michael Crumplin, a retired surgeon who has studied military history for over thirty years, has written a fascinating graphic and detailed account of Guthrie's day by day experience as a military surgeon. The book has been extensively researched, and is well referenced, illustrated and indexed. It is a splendid book which greatly adds to the literature concerning the Peninsular War and the life of an Eminent 19th Century soldier and surgeon. According to the author of this excellent book, George Guthrie was 'an exceptionally gifted clinician and surgeon, robust enough to perform well under fire, work tirelessly during and after combat, be outspoken surgically and withstand criticism from colleagues'. This impressive man received the accolade of being nicknamed the 'English Larrey'; a reference to his much more famous French surgical colleague Dominique-Jean Larrey. A comprehensive biography of Guthrie is long overdue and Michael Crumplin, a retired surgeon, has done a fine job with a well judged mix of biographical, military and medical detail. He tells the story of the wars with elan and makes skillful use of Guthrie's copious writings with many surgical cameos and revealing statistics. The book is much recomended for students of the history of military medicine and will also appeal to the general reader who wants a fresh (and brutally realistic) view of the Peninsular War and Waterloo. The publishers have produced it well with nice illustrations.